Every family or group of friends has a cruise director or battlefield general — that one person who’s great at organizing and making things happen. Let that person be in charge of the trip. If no one wants to take on the point person duty, many specialty travel-planning services can do it for you, such as Small World Vacations. You can also get concierge help with your itinerary if you book a stay on one of the Deluxe Resorts’ concierge floors (the highest-end onsite resorts at Disney World). Concierge staff can help you plan everything down to the very last ride. They can also help you during your stay (and guests can help themselves to snacks, continental breakfast and wine in the lounge). The point person should arrange a meeting to talk through the basics. Find out what everyone can afford. Disney World can be done on a very tight budget, but there’s plenty of room to splurge on a sky’s-the-limit, once-in-a-lifetime trip, too. It’s much simpler if everyone can afford (or is willing to enjoy) the same level of accommodations and dining. The point person will find it easy to manage payments since each family can book individually via MyMagic+, Disney World’s app that lets you make and manage all of your plans in one spot, from dinner reservations to FastPass to reminders for fireworks and other must-do events. Each family can also link to other parties’ accounts so reservations and other details can be viewed and shared by all. You’ll need to talk about travel personality, too. Does one family go gung-ho on ensuring they’re getting a thrill every second of the trip, while the other crew wants to spend some time in the hotel pool? You’ll want to make sure both sets are pretty happy with the itinerary–even if that means you split up for most of a day. And keep in mind each person’s particular interests and what they’d love to do. 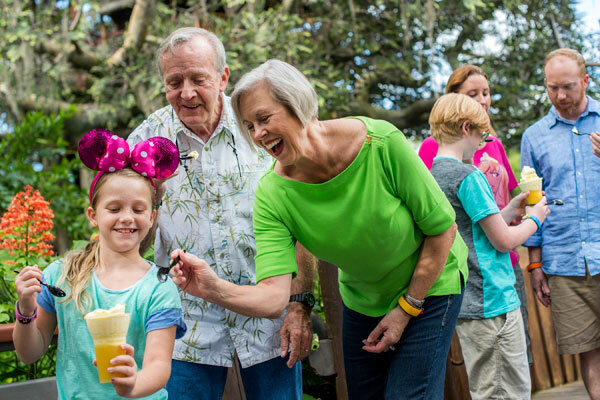 That may mean that the grandparents spend a day on a behind-the-scenes tour of what makes Disney tick, while the preschoolers have a ball in the Fantasyland play area. 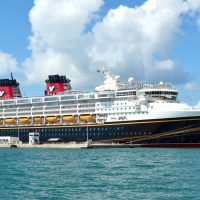 Choosing where to stay may be one of the toughest parts of planning a multigenerational trip to Disney World, especially if budget constraints vary wildly within the group. And there’s plenty to consider: You can stay at one of the 31 onsite hotels, which offer access to extra hours, free transportation to all of the parks, the ability to book meal plans that offer savings over buying meals a la carte, and earlier access to booking FastPasses to cut lines at in-demand rides. Or you can choose one of the countless accommodation options nearby, from the most basic motels to deluxe boutique hotels, and even tons of condos and larger homes to rent. Onsite, many hotel rooms can accommodate groups as large as five or six–usually with a pair of queen beds and a daybed/couch or pull-down bunk. But if you want a little more room to spread out, consider one of the multi-room suites in villa resorts. They offer shared areas, one or two bedrooms and a kitchen area. Disney’s Polynesian Resort has the gorgeous over-the-water bungalows and great views of Cinderella’s Castle across the lake. For a less expensive option, consider the Beach Club Villas or Boardwalk Villas, which are within walking distance of Epcot and Hollywood Studios. You could also try Disney’s Art of Animation Resort, which offers themed Family Suites that can sleep up to six guests, along with connecting rooms. For more help in finding accommodations for your crew, read How to Choose a Disney World Resort Hotel. Offsite, the options are practically limitless, from massive vacation homes that can host large parties to standard hotel rooms. You may need to spring for your own transport to the parks if you stay offsite, and you may want to consider getting multiple rental cars in case different groups need to break off at different times. Offsite options can often be less expensive than their onsite counterparts. The all-suite Caribe Royale Orlando may be perfect for a larger group, with one-bedroom suites that can squeeze in six, and two-bedroom villas with full kitchens that accommodate eight guests. It’s located just outside the gates to Disney World and offers a $4 shuttle service. The Embassy Suites by Hilton Orlando – International Drive/Convention Center offers guests free shuttles to and from Disney World and free breakfast each morning. The two-room suites can sleep up to six, with two doubles in the separate bedroom and a fold-out sofa bed in the living room. Let each person pick one must-visit ride or experience. Unless you’re planning a month-long sojourn in Disney World, you won’t be able to see and do everything. You’ll need to prioritize key events and rides so nobody misses that one ride they wanted to visit. In the initial planning process, find out what’s going to make or break the trip for each person in your party, and ensure those essential events are worked into the plan. Also, be realistic about how many rides and attractions you can visit in a day, especially if you’re trying to keep the whole crew together. Depending on how busy the parks are, how mobile your party members, and which rides you’re interested in trying, you may only get on four to five rides per day. Reserve group meals several months in advance. Advance reservations are essential to getting tables at the restaurants, especially if you’re picking high-demand eateries like Cinderella’s Castle or planning character meals. Make your reservations well in advance. You can book reservations via MyMagic+ or My Disney Experience on Disney World’s website (for up to 20 guests). If you have a group that’s larger than 20 people, call the dining line (407-939-1947) to request reservations. You may want to consider choosing off-peak times to eat (either early or late) to make it easier to accommodate your party. For any large-group dinners, an 18 percent tip will already be built into your bill. Buffet restaurants can be easy for large groups–especially those not on the dining plan–as they offer single-priced meals and plenty of different dishes to accommodate a wide range of palates. Try Chef Mickey’s at the Contemporary Resort or Epcot’s Biergarten. You’ll also find great dinner-and-entertainment meals, like the country-themed Hoop-de-Doo Revue at Disney’s Fort Wilderness Resort or the luau at Disney’s Polynesian Resort. Reserve group rides in advance, too. There are several attractions you can manage together–look for ones with larger capacity cars/boats, such as It’s a Small World or the Kilimanjaro Safari, or shows that offer plenty of seating, such as the Monsters, Inc. Laugh Floor or the Muppets 3D movie. And if your party includes kids who can’t or don’t want to ride the rides, you can take advantage of Rider Swap, where some members of your party ride, then swap spots and let the ones who were minding the kids take a turn. Don’t dismiss experiences outside of the park either. You can rent boats or kayaks at several of the resorts–including the Grand Floridian, the Yacht Club, the Beach Club, Contemporary Resort, Wilderness Lodge and the Polynesian–to take out on the lake. You can also book a special sunset cruise for your crew. Horseback riding is available at the Wilderness Lodge, and campfires (with accompanying marshmallows) can be had at most of the resorts. If you want to see a show together, consider one of the special dessert parties, like the Tomorrowland Terrace Fireworks Party. No matter how close you and the rest of your party are, you’ll want to part ways here and there. Breaking off into smaller groups may also make it easier to get reservations at some of those harder-to-reach attractions and events. And don’t think that you always have to break apart along party lines — perhaps all the teens (and a few adventurous adults) want to do an all roller-coaster day, while the over-21 crowd opt to sample goodies and cocktails around Epcot’s World Showcase. If your group’s especially large, it may make sense to split up during the day, then just meet up in the evening for dinner and fireworks. Take advantage of any extra services and splurges you might need. Memory Maker so you’ll all be able to utilize the professional photographers who are everywhere on the property, and make sure that everyone gets in the shot (you’ll want those iconic images of everyone in front of the castle!). If people in your party need a little extra help getting around, consider renting a scooter, wheelchair or stroller for the trip–you can book directly with Disney or (often for a slightly cheaper price) through an independent rental company. And look for ways to make life on the go simpler, such as arranging for your souvenir purchases to be delivered back to your resort, if you’re staying on grounds, or to the gates if you’re offsite. That’ll help ensure that no one’s left holding the bag all day long.